The leader of all Khārijite movements, a man known as Dhul-Khuwayṣarah, challenged the integrity of the Prophet (sallallāhu ʿalayhi wasallam) and accused him of social injustice and not judging by what Allāh revealed (of justice) in the matter of distribution of wealth. He claimed that he and those with him had not received a portion and that this was injustice. The Prophet (sallallāhu ʿalayhi wasallam) informed his Companions that there are others with this man and they will shortly come out against the Muslim nation and referred to them as renegades (Khārijites). He prophesied that they will kill ʿUthmān, the third caliph, will revolt against ʿAlī, his cousin who became the fourth caliph, who will fight and defeat them, and that they will continue to plague the Muslim nation. From the Prophetic traditions describing them: “They pass through the religion (Islām) like an arrow passes through its prey” and “Their faith does not pass beyond their throats” and “They recite the Qurʾān but it does not go beyond their collar-bones” (indicating ignorance and false scholarship) and “They speak with the best speech of the creation” (meaning, beautified, alluring speech) “(They are) young of age, foolish of mind” and “Their speech is beautiful, alluring yet their actions are evil” and “They are the most evil of the creation” and “They call to the Book of Allāh, yet they have nothing to do with it” and “They are the most evil of those killed beneath the canopy of the sky” and “Glad tidings for the one who killed them” and “If I was to reach them, I would slaughter them, like the slaughtering of Ād (a destroyed nation of the past)” meaning, every last one of them until none of them remain. “They will not cease to emerge, being cut off each time, until the Anti-Christ (Dajjāl) appears amongst their armies” and “They are the Dogs of Hellfire” and more. These groups appeared as prophesied within a few decades. They revolted against ʿUthmān on grounds of social injustice and claimed he was not judging by Allāh’s law but by personal interests. Later, they revolted against ʿAlī on similar grounds, claiming he had granted the right of judgement to men, thereby committing shirk (associationism). They treated what was not a sin and what were permitted ijtihāds (jurisprudential decisions) in matters of politics and governance to comprise disbelief on account of their ignorance. When they appeared and met new circumstances, they began to lay down the foundations of their doctrines, all based upon their own interpretations, following ambiguous passages of the Qurʾān whose meanings they did not understand. From their core principles: Takfīr on account of what is not a sin (legislatively permitted act, a permitted ijtihād or a forgiven, unintended error) or what is a blameworthy sin. Claiming that the lands of Islām have become lands of disbelief (dār kufr) because of the apostasy of the rulers. Obligating people to emigrate to them. Making loyalty and disloyalty to be centered around the rulers and takfīr of them. Testing Muslims through the doctrine of takfīr of the rulers as a means of validating their faith. Considering their activities to be ‘jihād’ and ‘enjoining good and prohibiting evil’ and using these slogans to deceive the young, ignorant and naive. Considering jihād against the rulers and Muslims who are not with them as the greatest of obligations and as an actualization of the declaration of faith. Their slogans were the verses, “Judgement belongs to none but Allāh.” (12:40) and “Whoever does not judge by what Allāh revealed are the disbelievers.” (5:44). They split into numerous sects, varying in their extremism and horrendous deeds. The unifying central core idea amongst all of them was the issue of ḥākimiyyah (judgement by Allāh's law), sulṭah (political authority) and the necessity of revolting against the rulers. The Prophet informed his nation that they will witness and encounter the self-indulgence and selfishness of the rulers who will come after and that they must show patience and not revolt, despite their tyranny and injustice. This is to maintain the greater, wider benefit to society, to harbour a lesser evil in order to avoid greater evil. In contrast, he ordered with the killing of the Khārijites, despite their beautified slogan and plentiful signs of overt piety, which was itself founded upon ignorance, extremism and exaggeration. The affair of the Khārijites became well known and their doctrines and activities were written in the books of creed for all posterity. However, at times and places when ignorance appears in Muslim societies, these doctrines can start to take shape if the right circumstances are present. 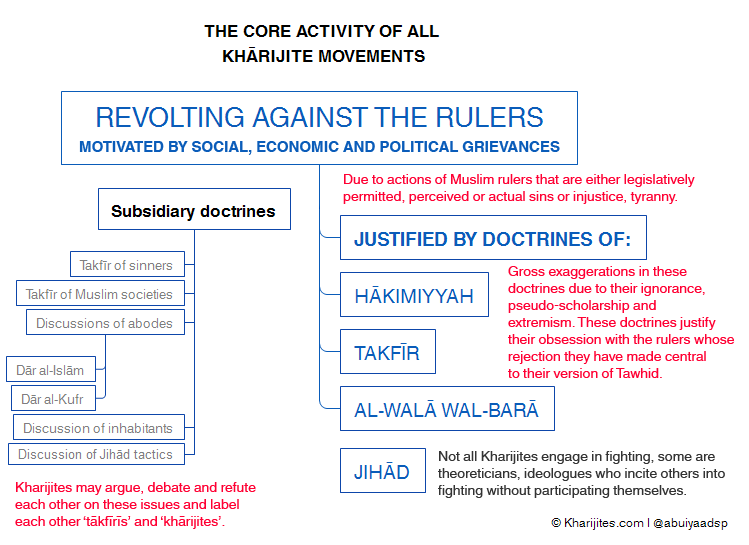 It should be noted that the Khārijite ideology, Khārijite movements and politically-charged interpretations of Islām are the perfect medium for external foes and enemies who have their own goals and designs to penetrate, support (economically or militarily), direct, lead, and bolster such movements to help further their own agendas. The Khārijites are therefore most harmful to Islām and the Muslims in more ways than one. One should also note the striking similarities between Marxist, Communist movements and their slogans (toppling of monarchies, tyranny of capital, social justice) and the basis upon which Khārijites frame their doctrines and activities. Both Abu al-Aʿlā al-Mawdūdī and Sayyid Quṭb - the latter being strongly influenced by the former’s writings - gave a narrow, political explanation of the basic declaration of Islām, (lā ilāha illallāh). They gave the word ilāh (deity) a meaning centred almost exclusively around the concept of “lawgiver” (ḥākimiyyah) and “political authority” (sulṭah), thereby opposing what was well known and established with the scholars of the Ahl al-Sunnah, past and present including Ibn Taymiyyah, Ibn al-Qayyim, Ibn ʿAbd al-Wahhāb and others. Built upon this distortion, they considered all contemporary Muslim rulers (perceived and presented as “lawgivers” and wielders of political authority) to have usurped divine authority and essentially declared them polytheists and apostates. Because of oppression (ẓulm), self-indulgence (istiʾthār), and disadvantaging the subjects for their own benefit, the rulers were considered to have not judged by justice, and not judging by justice means to have abandoned judging by Allāh's law. The stories of the Prophets and Messengers in the Qurʾān were then misinterpreted as being nothing but revolutions against despotic tyrants who had usurped divine authority by becoming lawgivers. The goal of the Prophets was distorted and presented as struggling to dismantle the thrones of the tyrants and re-establishing genuine political authority whose primary goal is to establish “social justice”. Thus, establishing political authority became the primary goal in this ideology. This required Islām and the matter of Tawḥīd to be focused around: Takfīr of the Muslim rulers, disbelieving in these rulers (kufr bil-ṭāghūt), declaring disloyalty (barāʾ) for them, striving to remove them and establishing a legitimate Muslim authority (khilāfah, imāmah) which returns political authority (ḥākimiyyah, sulṭah) to Allāh that had been formerly ‘snatched’ and ‘usurped’ by the rulers. Their chants and slogans incorporated the verses, “Judgement belongs to none but Allāh.” (12:40) and “Whoever does not judge by what Allāh revealed are the disbelievers.” (5:44). Jihād and enjoining good and prohibiting evil were then reframed as the struggle against apostate regimes (ṭawāghīt) in order to establish this narrow, restricted, politically-interpreted understanding of Tawḥīd. Because of the alleged absence of a legitimate Muslim political authority, a genuine Muslim state or society no longer existed - all lands inhabited by Muslims were lands of disbelief (dār kufr), and thus the greatest obligation was to create a genuine Muslim state and to bring about a jamāʿah, an ummah, that had long been “absent” (al-ummah al-ghāībah). From here, developing a new body of jurisprudence was embarked upon so that the proponents of this ideology who saw themselves as the only “true believers” could determine how to behave with these apostate rulers, government institutions (army, police) and employees and the societies of pre-Islāmic disbelief (jāhiliyyah) residing in lands of disbelief (dār kufr) - all of which are referred to collectively as “the near enemy”. The entire body of jurisprudence written within this context and which relates to jihad, enjoining good and prohibiting evil and loyalty and disloyalty is thus, built upon ignorance and distortion, is contextually invalid and has no basis in the writings of the well-known scholars such as Imam Aḥmad, Ibn Taymiyyah, Ibn al-Qayyim, Ibn ʿAbd al-Wahhāb. Rather, this doctrine is a merger between European materialist philosophy (Marxist, Communist revolution) and the doctrine of the Khārijite renegades of old who revolted against the Prophet's Companions on the very same grounds outline above and its target is the Muslim nation. Thereafter, the proponents of this ideology sough to read it into and weave it into the writings of Salafī scholars who are free and innocent of it, by trying to justify this devious ideology and their own activities by misquoting or misapplying their statements out of their contextual background. The leaders of these movements are motivated by worldly considerations that are then clothed and beautified with religious rhetoric and lofty slogans like the ones mentioned above. They recruit sentimental, emotional ignoramuses who are mostly young in age and foolish of mind who become foot soldiers for the cause. Their statements and declarations are full of anger, resentment, hatred, grievances about wealth, charges of takfir, calls for taking up arms and revolting against the authorities and so on. This heretical doctrine is nowhere to be found in the Qurʾān, nowhere to be found in the Prophetic traditions – rather the revealed texts clash with it. It is not found with the Companions, rather it was found with those who made takfīr of them and waged war against them – and they were ignoramuses who did not understand the Qurʾān, motivated by the world, cloaked in beautified religious rhetoric. It is nowhere to be found with the Salaf, rather they refuted it. It is nowhere to be found in the writings of Imām Aḥmad or any well-known scholar from the era of the Salaf. It is not found in the writings of Ibn Taymiyyah, rather it is refuted extensively and in detail in his writings. It is nowhere to be found in the writings of any of his students. It is nowhere to be found in the works of Ibn ʿAbd al-Wahhāb and his offspring. Rather, they refuted individuals and groups who emerged with these Khārijite ideas in their times, those who tried to promote views which are exactly the same as those of Quṭb, Mawdūdī, al-Zawāhirī, Bin Lādin, Abū Muḥammad al-Maqdisī, Abū Qatādah and other Khārijites. It is nowhere to be found in the writings of contemporary Salafī scholars. It is an alien doctrine who true roots lie in a merger between modern European materialist philosophy combined with early Khārijite doctrine. Its proponents such as Abū Muḥammad al-Maqdisī tried to read this heretical Quṭbo-Mawdūdian Khārijite doctrine into the writings of Salafī scholars, and they are free and innocent of it. It only has one name: Khārijism. From the above, it should be clear that the inner core of this ideology is centred around the subject of ruling by other than Allāh’s law, on the basis of a purely political explanation of lā ilāha illallāh. Muslim rulers are accused of usurping the right of Allāh by not judging by Allāh’s law completely and in its entirety (100%) or by making themselves “lawgivers” alongside Allāh by ruling with laws they brought from themselves or from others. They are then pronounced as “ṭāghūts” (false deities) and judged with apostasy on the basis of perceived sins (which are not actual sins) but are matter permitted in the Sharīʿah, actual sins, or injustice and tyranny. The lands they rule over are then judged as lands of disbelief (dār kufr). As this applies to all contemporary Muslim rulers, then no land of Islām exists and no Islāmic jamāʿah (a true Muslim society) is in existence. This demands a reframing of jihād as a struggle (of insurgents and revolutionaries) against all existing structures of rule in Muslim lands. And this is claimed to be “the Prophetic methodology in calling to Allāh” and “actualisation of Tawḥīd”. In actual reality these people are referred to in the Prophetic traditions as “Dogs of Hellfire”, “the worst of creation” who “pass through Islām as an arrow passes through its prey”. Note: this page will be updated with new quotes so please bookmark and revisit from time to time. In 1940s he claimed most special meaning of Tawhid lies in ḥākimiyyah (lawgiving) and sulṭah (political authority). Presents the spring and foundation of all evil and corruption on Earth to be political in nature, in the form of rulers, dictators, social classes or political parties who assume political power and impose their laws upon subject. This idea formed the fabric on top of which the 20th century Khārijite doctrine could be stitched and weaved. This was done by Sayyid Quṭb within two decades later. Sayyid Quṭb took the basic ideas of al-Mawdūdī and developed them into a fully developed doctrine coupled with a practical methodology. This became the idelogical springboard and fountain for all Takfīrī-Jihādī Khārijite factions in the 20th century. He accused all contemporary Muslim societies of pre-Islāmic society, denied the existence of an actual Islāmic society, accused all rulers, governments and societies of apostacy on account of their alleged ignorance of the meaning of the declaration of faith and called for general worldwide revolutions to topple the authorities. His doctrinal nurturing (Takfīrī-Jihādī Khārijism) came from Quṭb and al-Mawdūdī. The various books and writings of al-Maqdisī are an elaboration of what is found in the books of these two thinkers of the foundations of the ideology of Khārijism. This is the distortion of the Islamic creed as laid down by Quṭb and al-Mawdūdī. Gave fatwas during 1990s permitting the slaughter of children and women of policemen and soldiers in Algeria. He wrote a book revolving mostly around wealth, “The Responsibility of the People of Yemen (i.e. the Takfīrī Khārijites of al-Qaeda upon his ideology) Towards the Treasures of the Peninsula.” Meaning, plundering the wealth of the Kingdom of Saudi Arabia. Meaning that mosques paid for and maintained by Muslim governments are but manifestations of hypocrisy and one should not pray in them. The Khārijites withdraw themselves from Muslim societies and places of worship out of hate and resentment towards them built upon a corrupt, distorted, alien creed. Reminds you of the terrorism of the Azāriqah, an early Khārijite sect (see here). Their most intense hatred is reserved for the Salafī scholars, because they are the greatest of what stands between them and their perverted goals which are based on their perverted ideology. Meaning that currently the Khārijites are unable to find Syrians, Egyptians and Palestinians who - upon the necessities of the Khārijite doctrine - are willing to kill their fellow countrymen who do not agree with their views. In his book “Rulings Pertaining to the Armies and Police”. The Khārijites consider employees of government institutions that require loyalty, support and non-opposition as apostates. In the above quote he says no one is allowed to claim ignorance for not knowing the rulers are apostates - this essentially means that every single person who does not hold this view is an apostate, and thus a legitimate target for the Khārijites. Falsely claimed that the Prophets came to free people from political, social and economic slavery and that they came to established social justice in order to free mankind. He portrayed the Prophets as revolutionaries engaged in struggles with despots and tyrants and framed jihād within this context. In his Qurʾān commentary claims that the mosques of the Muslims have become as the worshipping places of the times of pre-Islamic ignorance (jāhiliyyah) because the society itself has reverted to jāhiliyyah. This is generalised takfīr of people by claiming they have rejected what he clams is the priniciple requirement of the declaration faith – the politically charged Khārijite interpretation that is. Passed judgement that raising and flying the flag of Muslim nations constitutes disbelief and apostasy and whoever does so is to be counted among the ranks of the disbelievers and pagans and treated as one at war on the battlefield. This is because to him this is a clear, open sign of allegiance to the false deities (rulers). This is generalised takfīr of the scholars of the Muslims in the various lands, and they do not grant excuse because the matter of the disbelief of the rulers is a matter they consider to be known by necessity, and scholars, of all people, cannot be ignorant of this. Muhammad Khalil al-Ḥakayma Under the pseudonym of “Abū Bakr al-Nāji”, authored “Idārat al-Tawaḥḥush” (“Managing Brutality”) - which is a template for a brutal form of terrorism). This was spread amongst followers of al-Qaeda and more recently ISIS. Al-Ḥakayma (killed in 2009) was a resident of Irān and worked in the broadcasting industry. Many of the terrorist incidents that took place in Saudi Arabia targeting oil refineries and other places were inspired by this book. Al-Qaeda (Khārijites) are used by Iran in places like Afghanistan, Irāq and Yemen for their political goals whilst the Khārijites in turn are pleased with such tactical support to further their own goals. Grieved about how rulers dispose of wealth. He is referring to 'collateral damage' wherein women and children are killed when they target government institutions and buildings with bombings. He is basically saying we cannot stop the 'jihād' for fear of collateral damage. Would steal from Muslims he considered apostates, such as policemen and those working for authorities and foreign non-Muslim Expats. He used to do this in Kuwait and Jordan and considered this a lawful means of acquiring livelihood. On a satellite channel program he was complaining about the rulers how they announce salary increases for government employees and keep millions in foreign banks. The issue again is one of wealth to the Khārijites. Meaning, imāms of mosques (and similar employees of governments) are apostates like the rulers, thus prayer behind them is invalid. In a treatise he states that fighting the ruler and those factions who are employed by him, at his service, and support him (army, police etc.) are to be fought because he argues this is defensive fighting which comes first, that the apostate deserves more severe punishment than the original disbeliever and because they are the “near enemy”. That is to say, the argument of 'pre-emptive' self-defence justifies killing the 'factions of apostasy' which include government employees.